Mark your calendars! I will host a free community shredding event Saturday, April 27, 9 a.m. to noon, to give you the opportunity to safely destroy personal paperwork. 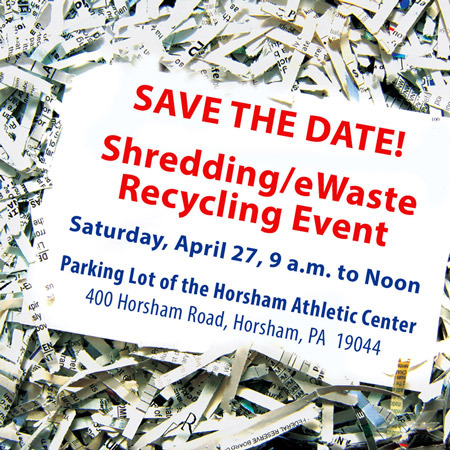 The event, which will feature an on-site industrial paper shredder, will take place in the parking lot of the Horsham Athletic Club, 400 Horsham Road. You’ll be able to watch as documents are destroyed. No businesses, please. Identity thieves have been uncompromising in their search for credit card numbers, bank account information and Social Security numbers. It is critical that you destroy documents containing this sensitive information. I encourage everyone to come out to my event to take the proper steps in fighting identity theft. Televisions can be recycled for $30. For more information, please call my office at 215-368-5165. 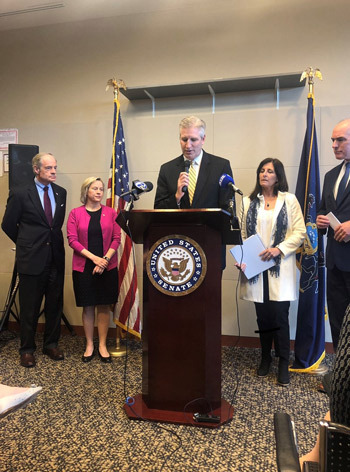 U.S. Sen. Robert Casey Jr. (D-Pa.) asked me to moderate a roundtable discussion with local officials and the Buxmont Coalition for Safer Water, along with hosting a press conference with Casey and U.S. Sen. Tom Carper (D-Del.) at the Horsham Library. We shared with the senators the health concerns, financial impact and overall frustration with the federal government’s response to the PFAS contamination in our community. As a result of our discussion this morning the senators are developing a plan to insert legislation into an upcoming federal bill to designate PFAS as a hazardous substance among other initiatives. Thanks to Sen. Casey for coming to Horsham and allowing me to lead the discussion. A cornerstone of this package is Marsy’s Law, a bill that seeks to amend the state Constitution by adding a victim’s bill of rights. Learn more about efforts to protect crime victims in Pennsylvania here. House Bill 962, sponsored by Rep. Mark Rozzi (D-Berks), would change the civil statute of limitations for child sexual abuse, allowing childhood victims until age 55 to file suit, and provide for waivers of sovereign and governmental immunity relating to claims of childhood sexual abuse. It would also abolish the criminal statute of limitations for child sexual abuse moving forward. House Bill 963, sponsored by Rep. Jim Gregory (R-Blair), would amend the Pennsylvania Constitution to provide a two-year window in which civil lawsuits alleging childhood sexual abuse may be filed in court, notwithstanding any otherwise applicable statute of limitations defense. The House also started the process of amending the Pennsylvania Constitution to provide a two-year window to anyone for whom a statutory limitations period has expired to commence action arising from childhood sexual abuse. These bills are important in the effort to ensure justice for victims of past abuse. Reporting suspected abuse is the best way to protect children. If you suspect a child is being abused or neglected, you can call the Department of Health’s toll-free ChildLine at 1-800-932-0313. Good news! We passed legislation this week to prevent seniors from losing their PACE and PACENET benefits due to an increase in the Social Security cost-of-living adjustment (COLA). We all know how critical this prescription program is to the 300,000 Pennsylvania seniors who depend on it for their life-sustaining medications. Unfortunately, the annual Social Security cost-of-living adjustments often push seniors who need PACE and PACENET out of the program due to the increase in income.